Before the advent of molecular biology, through classical electrophysiology experiments, Hodgkin and Huxley  established the physical basis for action potential generation and propagation. Working in squid giant axon, they demonstrated that the action potential consists of two voltage-dependent currents carried by an initial inward Na+ flux followed by an outward K+ flux. Hodgkin and Huxley hypothesized that voltage controlled the Na+ and K+ conductances by biasing the equilibrium of charged gating particles between two stable positions (resting and activated) within the transmembrane electric field. Activation of four independent gating particles in K+ channels and three in Na+ channels was proposed to turn on the conductances. This led to the prediction that the transmembrane motion of the charged gating particles would generate a small gating current. Because all of the gating particles would have to be activated before channels conduct, the movement of the gating charge (the charge carried by the gating particle) was predicted to precede the ionic current and be less steep in voltage dependence than the conductance (Fig. 2). Figure 1 Structure of voltage-gated channels. (A) Membrane topology of one subunit of a voltage-gated K+ channel. S1-S4 form the voltage sensing domain. S5, S6, and the P-loop form the pore domain. A series of conserved positive charges in S4 interact with negative counter-charges in S2 and S3. The fast inactivation gate is shown as an N-terminal ball. 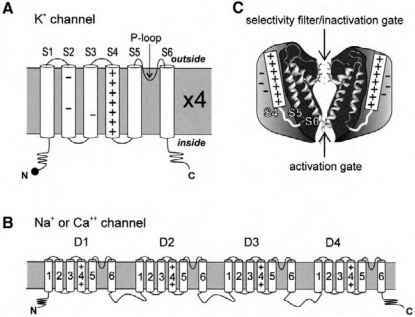 (B) Membrane topology of voltage-gated Na+ and Ca+ channels. (C) Side view of two subunits from (A). The pore domain is shown as a gray ribbon. The internal activation gate is located at the S6 bundle crossing. The selectivity filter and slow inactivation gate are located near the external end of the pore. Voltage-sensing domains surround the pore domain and regulate opening and closing of the gates. the formal charge of a positive (R, K) or negative (E, D) amino acid or the partial charge of a dipole moment of an a-helix—will experience an electromotive force (F) when placed in an electric field (E), with F = qE. A typical neuronal resting potential of -70 mV exerts a force of « 3 pN on a single charge in the membrane. For comparison, the typical forces generated by the motor proteins myosin and kinesin are 1.5 and 3 pN, respectively. Depolarization changes the electrical force, allowing the charge to relax to a new position in the electric field. The motion of the charge could be small, on the order of angstroms, or significantly larger. For example, a charged side chain could reorient itself in the electric field due to rotations around its chemical bonds. Alternatively, a rigid body motion of the protein backbone could move several charged side chains on a protein segment together through the electric field. It is energetically unfavorable to place a charge in the low dielectric, nonpolar environment of the membrane core. The pore has solved this problem for permeant ions by providing a polar pathway made of backbone oxygens, partial charges, and water (see Chapters 34 and 36). The same energetic constraints apply to the voltage sensor. Charges on the voltage sensor must either be stabilized by counter-charges or be hydrated by water. An early model of the voltage sensor paired oppositely charged surfaces in two membrane-spanning protein segments , providing a favorable pathway for charges to move across the membrane by ratcheting through a series of intermediate positions (Fig. 3A). Alternatively, charges may move from exposure to water on one face of the membrane to exposure on the opposite face through a short, polar pathway analogous to the selectivity filter (Fig. 3B and C). In either case, the pathway of the charge movement, or gating canal, must be constricted enough to prevent the leak of ions and contain stabilizing counter-charges.